I haven’t bought a mouse for donkeys years. 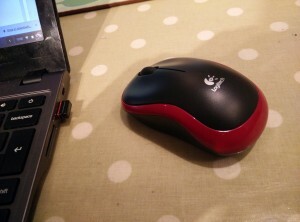 In fact I’m not sure I’ve ever bought a mouse. There has always been one around to use. This weekend I found it convenient to buy a mouse. I’ve been borrowing one of the kids’ and he has understandably periodically been nicking it back. 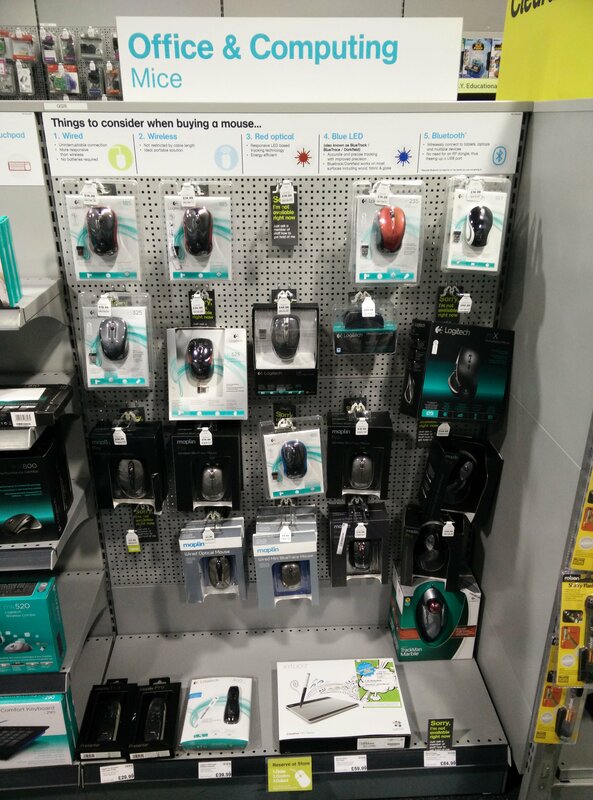 In order to purchase a mouse I went to MiceRUs otherwise known as Maplin in Lincoln. Maplin is a shop you can happily browse in for hours before buying what you originally went in for. Niche cable fittings sit comfortably next to remote controlled helicopters, disco sound gear, electric heaters and a plethora of other useful and essential gadgets and paraphernalia of modern living. Eventually I found my way to the mice section of the shop. I wasn’t expecting there to be a mice section. I thought it would be a couple of plastic boxes on a shel next to other PC accessories. Nope. Mice had their own section. There were roughly twenty different products on shale at prices ranging from a tenner to fifty quid. This is a problem. How on earth do you chose from such a range of devices all of which essentially do the same thing. Moreover they were all wireless mice. I’d thought that the choice would be wired versus wireless and maybe a couple of colour options. Nope. It was all wireless. Yes colour options but no wired. I didn’t really mind the absence of a wired mouse. Hey we all have to move on. My problem was how on earth do you choose. I flagged down a passing expert member of staff who was able to offer advice. They major on staff training at Maplin. “You have to choose one that feel right in your hand” he said. Only problem is they are all contained in the rigid plastic wrapping that requires a combination of uber sharp chisel and a pneumatic drill to open. Staring at the display for another minute or so I ended up buying a red one. Not the cheapest one, at £15 but I figured I didn’t want to be seen as a cheapskate. Anyway I got home, dug out my set of chisels and am now the proud possessor of a new cordless mouse. It works.